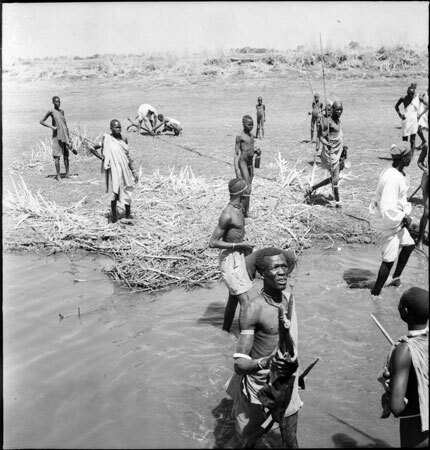 Looking from the side of a riverboat as it comes in to moor at the landing stage, with Shilluk people on the bank and in the shallows meeting it. Two men have taken the anchor some distance away and are attempting to fix it into the ground. In the foreground a Shilluk man with sculpted hair is about to hand a skin bag with wooden objects inside to someone on board. Morton, Chris. "Shilluk people on river bank" Southern Sudan Project (in development). 03 Jan. 2006. Pitt Rivers Museum. <http://southernsudan.prm.ox.ac.uk/details/2005.51.98.1/>.